Every acre of land gives us a choice: we can either use it to grow 113 kg of meat, or over 11300 kg of plant based food. To produce just one pound of beef takes over 2000 gallons of water. People in many countries are starving due to our inefficiency. Instead of people using vegetables as food, they are instead fed to animals for the privileged people to eat meat. Even though it’s even more extreme for most of the people, it’s worth considering that a person who follows a vegan diet produces 50 percent less CO2 and uses 1/10 the amount of oil, 1/13 the amount of water and 1/18 the land compared to meat eating people. However, going completely vegan is not an easy choice but by becoming more educated and mindful about the cost to our environment, we need to cut down the amount of animal products in our daily consumption. Apart from environmental benefits, switching to a non-meat diet has numerous health benefits as well. Automobiles and power plants seem to be the biggest contributors to our total greenhouse gas emissions, but actually our consumption of meat is the leading cause of the climate change. 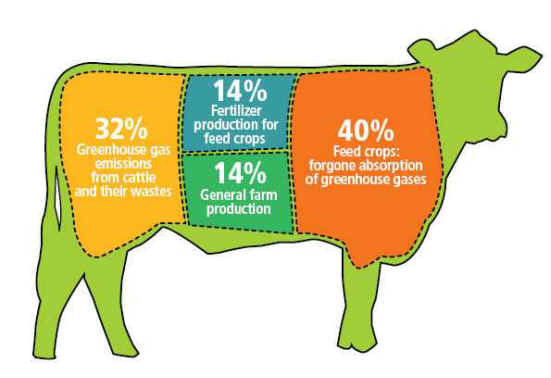 When its effects and bi-products are taken together, animal agriculture accounts for about half of global emissions. Average global meat consumption is in excess of 42 kg per year. It means, every human eats about 800 grams of meat per week. Global population of cows is over 1.5 billion and each of these cows emits 65 gallons of methane per day as a result of their feed digestion. We already know that methane is a potent greenhouse gas, trapping 25 times more heat in our atmosphere than CO2. When it just comes to sheer waste, 2500 cows are equivalent to a city of over 400,000 people. Every minute, the animals raised for food in the U.S. produce 7 million pounds of waste which goes into our waterways and oceans creating large dead zones. To make room for such a large number of animals we turned to deforestation. In Brazil, Amazon has been cleared at an astounding rate. Each second, an acre of the world’s rainforests are cleared. Our most diverse biosphere is disappearing. 110 animals and insects species go extinct on a daily basis. Livestock has taken their place and it covers almost 45 percent of the total land on our planet and uses one third of our freshwater supply. Moreover, we are pulling about 90 million tons of fish from the oceans each year. For every one pound of fish caught, five pounds of unintended marine species are brought up along with it and discarded as “by-kill’. A large number of people consider themselves as environmentalists. But as more and more of us learn that our animal consumption is the leading cause of species extinction, dead zones in ocean, water pollution, habitat destruction and climate change-causing greenhouse gas emissions, the question remains, are enough of us really prepared to make necessary changes to our lives to truly protect our environment? How can we solve this problem? Simply put, we can eat a lot less meat and dairy.